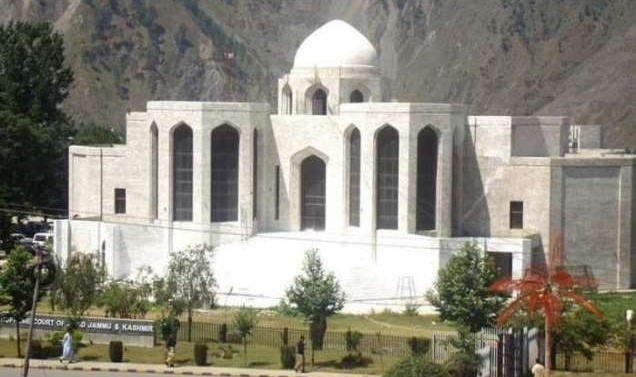 MUZAFFARABAD: The recent induction of five judges in the Azad Jammu and Kashmir (AJK) High Court was on Monday challenged by four lawyers in the same court. On May 23, HC Chief Justice M. Tabassum Aftab Alvi administered oath to Raja Raza Ali Khan, the then advocate general, Chaudhry Mohammad Munir, then district and sessions judge, advocates Mohammad Ejaz Khan, Chaudhry Khalid Yousuf, Raja Sajjad Ahmed Khan as judges, two days after their appointment was notified by the law department. Under the AJK constitution, a judge of the high court is appointed by the AJK president on the advice of the AJK Council and after consultation with the chief justices of the local supreme and high courts. Barrister Adnan Nawaz and advocates Shamshad Hussain Khan, Sardar Javed Sharif and Raja Izzat Baig in their petition made the AJK government and its law department, AJK Council, its chairman (prime minister of Pakistan), secretary and joint secretary, AJK president and the five new judges as respondents. Barrister Nawaz, also the counsel for the petitioners, recalled that the process for appointment against these vacant posts was initiated long ago and both the CJs had recommended and selected the qualified persons according to their best wisdom. The AJK president, after due inquiry and verification regarding the antecedents and credentials of the recommended persons, was required to send the consensus names to the AJK Council for its advice. However, the president sent a summary of names of the five persons to the council who were not consensus nominees due to which the summary was returned as being not in accordance with the relevant constitutional provision. Purportedly, he alleged, in the second round the president had exclusively sent the names of respondents 10-14 to the council, surreptitiously without any consensus oriented consultation/recommendation of both the CJs as required by the constitution and the council had issued illegal advice under misconception due to misleading correspondence of the president. He alleged that the names had not been recommended by both the CJs and, therefore, they were not the consensus nominees. Additionally, since Mr Munir had been a district judge for two years before his elevation to the HC, he did not fulfil the constitutional requirement either, he added. The counsel argued that the HC CJ was the best person to appraise the qualification, integrity, ability and fitness of a person for judgeship in the light of his knowledge and observation during the legal practice of such person as an advocate or pleader. Therefore, ignoring the opinion of the HC CJ for appointment of a person as a HC judge was not justified in any way, he said. He argued that if the mode of appointment of a person against the post of HC judge was not transparent in the true spirit of the Constitution, it would seriously injure the independence of judiciary and hamper the administration of justice. The meaningful and consensus oriented consultation was not a mere ritual but a mandatory requirement under the constitution which could neither be ignored nor substituted by any other mode or manner, he said. He alleged that the impugned notification was politically motivated, pre-conceived, collusive and issued with mala fide to deprive the institution of judiciary from judges of integrity, and should therefore be declared void, ineffective and of no legal effect. Consequently, the five posts be also declared vacant and they should be restrained from working, he added.